Ask most fans to name the first left-handed golfer to win the Masters and they'll probably say Phil Mickelson. Wrong. Mike Weir claimed the green jacket in 2003, the year before Mickelson won the first of his three (and counting) Masters titles. While Weir has fallen off the radar a bit, due largely to a nagging wrist injury, he's already made his mark on the game. He was Canada's first major champion and a mainstay on several Presidents Cup teams for the International side, among other notable achievements. Weir's quick, efficient swing is certainly worthy of study. But his unusual pre-shot routine is Weir's true calling card. Weir's signature: Instead of a conventional waggle (moving the clubhead back and forth behind the ball), Weir rehearses his full takeaway after addressing the ball. After setting up to the ball, checking his alignment and looking at the target a couple of times, Weir takes the club back about halfway to the top, then stops and returns it to the ball. He then takes his actual swing, precisely emulating the practice takeaway. Unlike some players with a similar routine, Weir doesn't watch his hands or the club during his rehearsal, focusing on the ball instead. Why it works for Weir: As with all such practice techniques, Weir has a specific goal that he wants to transfer to his full swing. He was once prone to shutting the clubface on the way back – a remnant from his days playing hockey – which led to a closed clubface at the top and a tendency to hook the ball. When rehearsing, Weir rotates the left arm to ensure the clubface stays square on the way back, with the toe pointing straight up when the club is parallel to the ground. Weir also wants to prevent the club shaft from travelling too much around his body, so he makes sure to keep it moving straight back, then up, during his practice backswing. His actual swing merely replicates this action. How it can work for you: If you struggle with specific, repeating swing flaws, the pre-shot routine is a great place to ingrain the proper motion. It's also a great tool when you're working on a new move or other swing change. You can follow Weir's example and rehearse after setting up to the ball, or simply integrate the move into a pre-address practice swing. It's all about muscle memory, training your body to do what you want it to do naturally, without having to think or consciously make it happen as you swing. There are few things you can do to cement yourself in the pages of golf history that will compare to winning the Masters. When he took home the green jacket, Mike Weir assured his place in the history of this great game. Although he may not have the long list of accomplishments to match some of his Masters-winning peers, Weir can be proud of a highly successful career on the course. Obviously, anyone who has the game to win at Augusta National can claim that they were, at least for a period of time, among the very best golfers in the world. When the average golf fan thinks of Mike Weir, they think of two things – his Masters win, and his pre-shot waggle. The waggle became famous around the golf world while Weir was playing at a high level, and many amateur players tried it out for themselves once they saw the success that Weir was able to achieve. Never a long hitter, Weir was incredibly accurate when he was at his best, and the results spoke for themselves. If you aren't familiar with the extended waggle that Weir used during his career, or if you have simply forgotten, a quick look at an online video will show you everything you need to see. Rather than just waggling the club behind the ball back and forth over the span of a few inches like most players, Weir took the waggle to a new level by moving the handle of the club back to about hip-height before returning it back to the ball. Using this extended waggle, Weir was able to rehearse most of his backswing before the swing actually begun. Obviously, it worked for his needs, as he was able to play for many years at the top of the game. So, is this sort of pre-shot waggle something that you should consider adding to your own technique? Well, that depends. Some golfers will find that preparing for the swing in this way helps them to get ready to make a quality motion, while others will find it time consuming and even distracting with little to no benefit. In this article, we are going to go over the pros and cons of using this kind of a waggle. 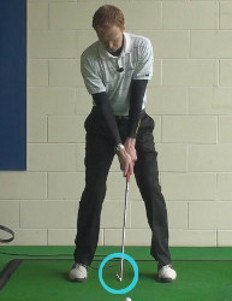 Once that is complete, we will then look at how you can build this extended waggle into your swing if you so choose. The good news for the average golfer on this topic is the fact that you don't need any special talent in order to use this waggle. Usually, when trying to copy a professional golfer, you will find that the talent they possess is a major hurdle between the swings they make and those that you use to get around the course. However, that isn't the case with something like a waggle. It doesn't take any specific talent to use an extended waggle – you just have to be willing to put in the work to make this move comfortable and repeatable. Despite the fact that Mike Weir plays the game left handed, the instruction in the article below is going to be based on a right handed golfer. If you do play left handed, please be sure to reverse the instructions as necessary. First, we will start with the positive side of this idea. After all, there have to be plenty of positives to mention if someone like Mike Weir decided to use this pre-shot routine in his game. While not all of the points listed below will actually play out to be a positive for everyone who tries this method, these are points which most people will generally determine to be benefits of the extended waggle. Rehearse the all-important takeaway. Most amateur golfers fail to understand the importance of the takeaway in the golf swing. The first foot or so of the backswing is incredibly important, as it sets you on a path that is going to determine how the rest of the swing plays out. If you get off to a poor start with your swing, there is very little chance that you will be able to make the necessary corrections before impact comes back around. By practicing your takeaway just moments before your swing begins, you should be able to 'remind' yourself of how you are trying to move the club in order to start your swing. The takeaway is something that frequently goes wrong for the average golfer, and using an extended waggle is a great way to hopefully correct this crucial part of your technique. Calm your nerves. It is easy to get a bit nervous over the ball when you are out on the course, especially if you are hitting a shot while other golfers are watching. If you know that you tend to get nervous while playing, consider using this kind of waggle in order to settle yourself down successfully. Performing the waggle action prior to your swing will help you to shift your thinking from the outcome of the shot to the process of making the swing. Every golfer knows how difficult it is to perform while nervous, so consider adding this simple move in order to take some of the nerves out of your game. Work on your tempo. The golf swing is not just about static positions that you need to hit along the way – it is also about the tempo that you use throughout your swing. When you swing the club with good tempo, you can actually 'iron out' some of the minor technical mistakes that you may be making. Using the extended waggle will give you a chance to practice the tempo that you would like to use in your takeaway. It is easy to fall out of your tempo during the course of a round, especially as your emotions go up and down based on your performance, so the waggle can be a way to pull you back into a good rhythm. Prevent the 'freeze up'. When you stand over the ball prior to starting your swing, you will always run the risk of freezing up in your stance before the club gets started. After you have finished taking your stance, there will be a moment or two without movement before you start the swing – and those moments of inactivity can cause your body to freeze up in place. Once you are 'frozen' in place, you will find it quite difficult to get started once again. This is the exact reason why most golfers use some form of a small waggle in order to avoid getting stuck in place. Using the longer version of the waggle will have the same desired effect – it will help you to stay in motion so you can start the swing without any hesitation when you are ready. The four points above are just a sampling of the positive effects that an extended waggle can have on your game. Are these positives enough to outweigh the potential negatives below? That is going to be up to you to decide. Once you read through the list of negatives that we have compiled below, you will have to decide for yourself if the extended waggle is something worth pursuing in your own game. Nothing is perfect in the game of golf – and that certainly applies to this type of waggle. Sure, there are plenty of positives to be enjoyed, but there are also some drawbacks that you are going to need to keep in mind. Only when you are sure that the positives are going to outweigh the negatives should you go ahead with trying to use this technique in your own game. If the positives don't outweigh the negatives, the obvious next step is to work on some other kind of move that can help you make more consistent golf swings from the first hole on through to the last. Your own personal opinion will have an impact on this list, so these are not meant as negatives that are set in stone. Many golfers will feel that these points are significant drawbacks, while others will not find them to be any big deal at all. Time consuming. Let's be honest – golf is not a game that needs to be made any longer. Some players already feel that the game takes too long, as a full 18-hole round of golf usually takes up at least four hours, if not much longer. By adding in another layer to your pre-shot routine, you are going to be taking more time before hitting each shot. It might only be a few seconds per shot, but those seconds add up over the course of a full round. If you are going to move forward with this pre-shot ritual, it will be important to review your entire pre-shot routine to look for places where you can cut out time in order to keep your rounds moving at a reasonable pace. Can lead to overthinking. There is plenty of time to think about your swing while on the golf course, and that is usually a bad thing. You don't want to be thinking too much while you play – you want to simply see your targets and respond with a swing that is going to send the ball in the correct direction. By rehearsing your backswing prior to starting your real swing, you may cause your mind to overthink the shot you are about to hit. For example, if you see or feel something during your extended waggle that you want to change before your full swing, you will be naturally thinking about that adjustment as your swing is taking place. A big part of playing good golf is the ability to 'get out of your own way', and this waggle may make it tough to do just that. It takes practice. Just like anything else in golf, you are going to have to practice the extended waggle if you would like to make it a successful part of your game. Of course, practice time is probably not something you have in ample supply. Trying to squeeze in time to practice your game while also keeping up with life's demands can be difficult. A professional golfer like Mike Weir has plenty of time to work on his game, but the story is different for someone who plays the game as a hobby. As an amateur who wishes to improve, you may be better off spending your practice time on parts of your actual swing. You don't want to be a robot. This point goes along with the point listed above regarding overthinking your swing. While it is a good idea to have solid fundamentals in place in your golf swing, you don't want to turn yourself into a robot out on the course. The shots that you are required to hit on the golf course are widely varied, meaning you need to be able to adapt on the fly if you are going to play well. When you get too stuck in your mechanics, however, you may not be able to adapt to different lies, slopes, wind conditions, etc. 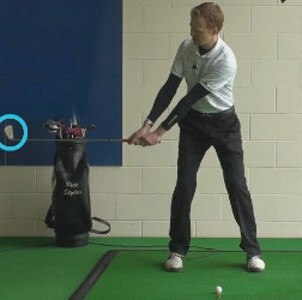 Using an extended pre-shot waggle won't automatically turn you into a golf robot, but it certainly will move you at least a step or two in that direction. As you can see, the list of potential negatives in this case is rather significant. You don't want to discount these drawbacks, as they are points that you will have to live with if you do decide to use the extended waggle. Think about each of these points carefully before deciding if you are going to spend practice time on this unique golf technique. For the purposes of this section, we are going to assume that you have decided to go ahead with the extended waggle in your own game. Once you make that decision, the first thing you need to do is get to the driving range to learn how to perform the waggle prior to your swing. This is not something that you want to put to use for the first time when you head out onto the course, so be sure to put in some preparation before you try it on the first tee. To perform the extended waggle, follow the steps below prior to beginning your swing. Before you can get to the point of performing the waggle, you need to first work through the rest of your pre-shot routine. That should include picking out a specific target, selecting a club, visualizing your shot, and more. Putting together a pre-shot routine is a personal process as your routine needs to be comfortable and natural for you. The waggle should be seen as the very end of the pre-shot routine – it is the last thing you do before actually starting the swing. Once you get into your stance, you are going to want to take a look at the target and settle in to an address position. You should be preparing as if you were going to start the swing at this point. Place the club head down behind the ball, make sure you are comfortable in your stance, and then perform the waggle instead of starting your swing. The waggle is essentially going to be an exact copy of the first half (or more) of your backswing. You are going to make your takeaway as you would normally, swinging up as far as you like before bringing the club back down to the ball. Mike Weir swung up to the point where his hands were around hip-height going back, but you don't have to copy his example exactly. Try out a variety of waggles on the driving range before settling on one that feels comfortable to you. After the waggle is complete, set the club back down behind the ball and then start your swing within just a moment or two. It is important to avoid freezing up over the ball after you have finished with the waggle – the whole point of the waggle is to give yourself some confidence and rhythm before starting the swing, but that will be lost if you stand still too long after you are finished. Perform the waggle, re-address the ball, and swing away. At first, this routine is probably going to feel pretty uncomfortable on the range. Don't give up on it after just a few shots, however – you need to be patient and give yourself some time to learn how to use the waggle in order to make your swing more effective. You will really only be able to judge the effectiveness of this routine after a few range sessions have been completed. In fact, you really shouldn't give up on it until you have tried it out for a round or two so you can see some results (positive or negative) on the course. As you practice, you should be paying attention not only to the kinds of shots you are hitting down the range, but also the way you are feeling over the ball. Is this new routine giving you confidence, or do you just feel uncomfortable? The extended waggle is as much about improving the mental side of your game as it is about improving your physical swing, so make sure it is having the intended effect before deciding to carry it forward for the long run. Should You Waggle in the Short Game? Consistency in golf is hard to come by, but it certainly is desirable. The more consistent you can be with your game, the better your chances will be of playing at a high level day after day, year after year. With that in mind, it might be tempting to use the same kind of exaggerated waggle in your short game that you are now using in your long game. After all, if it works for your full swing, shouldn't it work for your short game as well? That is a logical line of thinking, but it is not necessarily true. For one thing, your short game shots are obviously played with a shorter swing than your long shots, meaning you won't be able to waggle to the same degree. Also, it is important to remember that the short game is all about feel and touch. By rehearsing your mechanics prior to hitting each shot, you might fall into the trap of thinking about your short game from a mechanical perspective rather than letting your hands feel the shot properly. The best short game players think very little over the ball, and that is something you should aspire to imitate – simply seeing the target and reacting with a swing that will send the ball close to the hole is the best way to play short shots. With that said, you should still use a traditional waggle prior to starting your short game swings in order to keep feel and rhythm in your body. Move the club head back and forth slightly while preparing to chip or pitch the golf ball in order to relax your hands and forearms. Nearly every professional golfer in the world uses this kind of basic waggle to make sure they stay relaxed prior to hitting a delicate shot. Everyone waggles the club a bit different at address, but make sure you have some kind of motion built in to your address position. The extended waggle that Mike Weir used throughout much of his career certainly has plenty of positives, but it does have some drawbacks as well. It is not a technique that is going to work out successfully for all golfers, but it can help some players get into a better rhythm out on the course. If you are interested in this method, give it a try on the driving range before attempting to use it during an actual round of golf. Good luck!